Welcome to our 22Bet review where we take a closer look at this new and licensed online casino! In order to get the welcome bonus, you must activate the bonus code 250CASINO in the cashier when you make your first deposit. The minimum deposit amount is £10, and a deposit of £250 will maximise the bonus and give you a total starting balance of £500. You can withdraw your real money balance whenever you like, and you need to wager the original deposit once within 7 days to get the bonus. The bonus has a wagering requirement of x39. In addition to the 100% bonus, you will be treated with 22 free spins that can be used on some of the most popular slots at 22Bet. Once you have activated the bonus code and made your first deposit, you can play the spins on any of these hit NetEnt slots: Starburst, Spinata Grande, Jumanji, Witchcraft Academy and Hotline. Simply open the game you wish to play and start spinning – the free spins can be used on one of the slots or across all five of them, the choice is yours. The winnings from your free spins will be added to your real money balance once you have completed the wagering requirement of x39. 22Bet’s generous welcome package with a match bonus and free spins will let you explore the casino with a boosted balance of up to £500. We will come back to 22Bet’s fantastic games library later in the review, but the selection consists of the best software from NetEnt, Quickspin, Blueprint and many other top game providers. There are even two separate live casinos to choose from, but you should note that you can only play the games in the “casino” section when there is an active bonus on your account. Casino bonuses give players extra value and entertainment for their money, and 22Bet’s welcome bonus is one of the best we’ve seen in a while. The wagering requirement of x39 is very fair compared to the generous maximum bonus amount. Before you start playing, you should set aside a few minutes to read through 22Bet’s bonus terms and conditions. In addition to the wagering requirements, there are a few rules you need to follow while playing with bonus funds. The maximum bet while playing with the bonus is £3, so make sure to not go over the limit. Your bonus could be forfeited if you spin with a higher bet on a slot machine, even if it happens by accident. The bonus wagering must be completed on the “bonus slots” category within 30 days after making the deposit, giving you over 100 great slots to choose from. Head over to the bonus page at 22Bet to get the full bonus details, and remember to enter the bonus code 250CASINO when you make your first deposit to get the generous welcome bonus. The team behind 22Bet knows that active casino players want to be rewarded with valuable promotions and good deals, and the website has a dedicated promotions page where you can find special offers weekly. Although the casino doesn’t have a dedicated loyalty program with automatic rewards and gifts, which is a big feature at many online casinos these days, you will be able to participate in free spins bonuses and deposit bonuses every single week. The best part is that the offers are listed on the promotions page so that you’ll always know what’s coming up. Whether you like free spins on NetEnt slots or deposit bonuses that boost your balance with extra playing cash, there’s always something fun to look forward to. At the time of this review, players who have made their first deposit can participate in three unique promotions every week. On Mondays, you can get 50 free spins on a popular slot when you make a deposit of at least £20 with the bonus code MONDAY50. Thursdays are called “hot days”, as you’ll be rewarded with up to 50 free spins when you deposit and play during the week. And don’t forget about the Friday reload: every Friday, you can get a 50% deposit bonus up to £200 + 22 extra spins when you make a deposit with the bonus code FRIDAY22. The casino’s weekly promotions will keep you entertained throughout the week before kicking off the weekend with an excellent deposit bonus. There are also sportsbook offers from time to time, and 22Bet likes to mix things up now and then, so make sure to visit the promotions page often to not miss out on a great deal. In addition to the weekly promotions, you might be offered personal bonuses and casino goodies from time to time. You can set your preferred communication methods in the settings on your account, letting you subscribe to the e-mail or SMS newsletter if you want to be notified when a great new offer is available for you. 22Bet doesn’t have a dedicated loyalty program that automatically rewards you with casino goodies such as free spins or points at the moment, but the weekly casino offers can give you a lot of extra value when you deposit and play. In the next part, we’ll have a look at 22Bet’s fantastic selection of slots and casino games. NetEnt: NetEnt has the biggest game library of all the providers available at 22Bet, and there are over 150 NetEnt games to choose from in total. This means that you can play some of the best slots on the internet including classics such as Drive, Koi Princess, Creature of the Black Lagoon, The Invisible Man and Neon Staxx. NextGen: NextGen is an experienced studio that has been making slots for almost two decades. Their goal is to make engaging slots that manage to keep the players entertained and as they play. Some of the most iconic NextGen slots include Foxin’ Wins, Medusa II, King Kong Fury, Gorilla Go Wilder and Mad Mad Monkey. Big Time Gaming: The Australian gaming company Big Time Gaming has become one of the most popular slots makers in just a few years thanks to their innovative Megaways games and slots with enormous payouts. Make sure to check out BTG slots such as Danger High Voltage, Bonanza, Holy Diver, Dragon Born and Extra Chilli. Quickspin: There are over 40 Quickspin slots to choose from at 22Bet which means that you have instant access to some of the most played slots on the internet. If you’re looking for colourful and exciting games, you can’t go wrong with the slots from Quickspin. Some of our favourites include Sticky Bandits, Hot Sync, Eastern Emeralds, Big Bot Crew and Sevens High. ELK Studios: ELK is a Swedish game provider that creates high-quality slots. One of the company’s top hits, Wild Toro, won the prestigious gambling award “Game of the Year” in 2017. In addition to this award-winning slot, you should check out other ELK games such as The Wiz, Kaiju, Vegas Diamonds, Joker Games and Platoons. Thunderkick: Thunderkick is another prominent games provider with headquarters in Sweden. The studio became famous when they released the hit game Fruit Warp in 2014, but they have released many fantastic slots since then: The Falcon Huntress, Wild Heist, Rocket Fellas, Well of Wonders and Jaguar Temple, to name just a few. Our list offers just a small sample of the slots you can enjoy at 22Bet. You will also find the software from the big-name game providers Blueprint, Lightning Box, NYX, 1×2 Gaming and many more. Few online casinos have every popular game provider on the internet, but we hope that 22Bet add studios such as Microgaming and Yggdrasil at some point in the future. We also noticed that some of the games from the providers that are available are missing. For example, Blueprint Gaming has a huge portfolio, but there are only around a dozen Blueprint slots available at 22Bet. We would also appreciate some more jackpot slots. Although 22Bet has the full library of NetEnt slots, you won’t be able to hunt the life-changing jackpots in Hall of Gods or Mega Fortune. Even with the few missing games, 22Bet has a fantastic slots selection that is better than what you can find at most UK casinos. If you want to play something else than slots, you can try your luck in computer versions of iconic table games such as roulette, blackjack and baccarat. The full selection of NetEnt’s high-quality table games are in place which means that you will find several variations of roulette, blackjack, casino hold’em, baccarat, Texas hold’em and more. If poker is your thing, you can play iconic video poker games such as Jacks or Better, All American, Joker Wild and more. Note that there aren’t any categories dedicated to table games and video poker games in the lobby, so you’ll have to browse the games provider list or use the search function to find the type of game you wish to play. Check out the casino section at 22Bet to see all the fantastic games that are waiting for you once you’ve registered an account! Bet on Poker: Bet on Poker is in our opinion one of the most fun live casino games at 22Bet. The game is a simplified version of Texas hold’em where the goal is to bet on the winner of each hand. The dealer hands out two cards to six virtual players, and you place your chips on the player that you think is going to take down the pot. The odds of the players change as the turn and river dealt, and you can place new bets after each card. This is the ultimate live game for poker fans. Dice: Cross your fingers and watch as the dealer throws five dice into the pit. Anything can happen in Dice, a luck based game with many betting options. You can bet on everything from pairs and specific numbers to sequences, or maybe you want to place a bet on your lucky number. If you really feel fortunate, you can bet on five of a kind for a potential payout of 500 to 1. War of Bets: War of Bets is a straightforward game where the goal is to bet on the highest card. The dealer deals one card to the player box, and you simply bet on whether the dealer box will get a lower or higher card than the player. The odds change depending on the player’s first card, and there are several side bets such as suits, colours, total values and more. This is a high-speed game where the action never stops. Wheel: The Wheel is one of the most popular live casino games at 22Bet. This is a wheel of fortune style game where you bet on where the wheel clapper will land. If you manage to predict the correct number, you’ll be paid a win of 18 times the bet. But there are also several side bets such as the number ranges, colour and even/odd. You can also combine bets for maximum excitement. Lucky 7: Lucky 7 is a lotto style game with 7 balls. The goal of the game is to predict the value of the balls that drop down into the slot. There are several bets to choose from including the colour of the balls, total value, and specific balls. But the biggest possible win is yours if you manage to predict 4 correct balls: this lucky bet is worth 2,000 times the money. There are also lucky 6 and lucky 5 variations of this game. Dice Duel: Dice Duel is another simple game that reminds a bit about War of Bets. The casino throws one red and one blue die, and you simply bet on the highest die outcome or draw. You can also bet on specific dice values, odd/even or total value for boosted prizes. To spice things up a bit you can also combine more bets on the bet slip for an even fatter payout. If you want to try something new and fresh, you can’t go wrong with any of the exciting games on the list above. 22Bet offers both traditional table games that are played in real casinos around the world and entirely new types of online gambling experiences. There are over a dozen live games available in total, and the tables are open for players 24/7. Play against real, professional dealers and have a chat with the other players as you play casino games the way they were meant to be played. You can learn more about live casinos by checking out our casino guides. 22Bet launched in 2018, making it a new UK casino with a fresh look and modern features. The website has a stylish design, and navigating through the pages and categories is super easy thanks to the header menu at the top of the site. From the menu, you can switch between the sportsbook, casino, live casino and promotions to quickly find the games or information that you are looking for. And when you are logged in, you can access the cashier and your personal dashboard from the drop-down menu in the top right corner. The casino lobby is quite basic and could use a few more features. While we appreciate the fact that you can sort games by providers, there is no way to filter jackpot games, table games or video poker games. A favourite button that lets you save your favourite games is also a handy feature that is missing. Finding the games in the specific categories can be a hassle, but there is thankfully a search function that works well. The games themselves load lightning fast, and we didn’t have any issues with any of the slots we tried out. Those who like to immerse themselves in the games will like to hear that it’s possible to play any game in fullscreen mode. Visit the account pages to change your personal information and to adjust your settings. The transactions tab lets you go back in time and see every deposit and withdrawal that you’ve done since you created your account. If you are claiming the first deposit bonus or any of the weekly offers, you can activate the bonus codes from the promo section to automatically get the offer when you make your next deposit. And make sure to have a look at the responsible gaming tools that are available – you can set deposit limits, loss limits, timeouts and more from the account page. One of the features we like the most is that you can upload your documents straight to your account, without having to send them by e-mail. Once your documents have been uploaded and processed, you can check their status on the same page. 22Bet’s mobile site is just as good as the desktop version. The mobile casino lets you play your favourite games on the go, and virtually every slot is available on the mobile site. The basic site features can be accessed from mobile as well which means that you can activate bonus codes, participate in promotions and get help from the live support wherever you are. There is no dedicated 22Bet app available, but the browser version works just as well on any smart device. If you’re ready to check out 22Bet for yourself, you can choose between many payment methods to make your first deposit. The standard online payment methods are available, including Visa, Mastercard, bank transfer, Skrill, Neteller and Paysafecard. 22Bet does not charge fees on payments, so everything you deposit is added straight to your player account. You can visit the payments page to learn more about the deposit methods that are available at 22Bet. Making withdrawals is quick and simple. When you have cash in your real money balance, you can make a withdrawal by clicking on the withdraw button in the top right menu. Once your withdrawal has been processed by 22Bet’s payments team, the money will be sent to your chosen account. Payments to e-wallets will show up instantly, while bank transfers might take a few days to appear. Note that 22Bet has a “closed loop” policy which means that you must withdraw to the same bank account as you deposited with; a standard procedure at most UK online casinos. Since 22Bet is regulated in the UK, your winnings are tax-free. 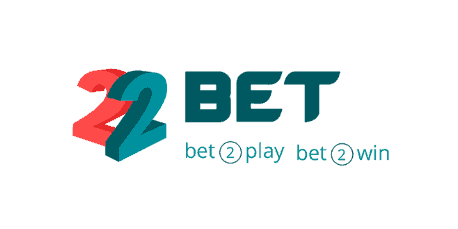 22Bet is licensed by the UK Gambling Commission. The company uses the most robust 256-bit technology available to ensure that your private information is kept safe. Making deposits and withdrawals and verifying your account by providing personal documents is completely safe thanks to the website’s secure SSL technology. You can learn more about 22Bet’s security policy on their website. If you need any help while playing at 22Bet, you’re always welcome to contact the customer support. The support is available 24 hours a day, 7 days a week, and by clicking on the chat icon in the bottom right corner you will instantly be connected to a friendly live support agent. The support is happy to help you with any technical issues or answer any questions you may have about payments, the games, or anything else. If you’d rather get support via e-mail, you can send an e-mail to [email protected] E-mail support is not as quick as chat support, but you will get an answer as soon as an agent has reviewed your inquiry. You can also reach support via phone by calling +44 2037 690147. For general questions, you can visit 22Bet’s extensive FAQ section. The FAQ page has information about security, banking, responsible gaming and more. You might not need to contact the support by checking the FAQ for an answer first, but the 24/7 chat support is happy to help you with whatever you might need. The chat is also available on the mobile site in case you need assistance while playing on the go. In this review, we’ve had a close look at an exciting newcomer on the UK casino market: 22Bet. 22Bet is a sports betting site and casino with a generous welcome bonus, weekly casino promotions and a wide selection of slots. The excellent live casino is one of the best things about the site thanks to it being powered by three world-class live game providers. New players from the UK can choose between a sportsbook bonus or a casino bonus on their first deposit. The casino welcome bonus gives you a 100% bonus up to £250 + 22 free spins. The bonus has a wagering requirement of x39, and you can play it across any of the games in the “bonus slots” section in the games lobby. The free spins can be used across a selection of hand-picked NetEnt slots including Starburst, Spinata Grande, Jumanji and more. Once you have registered an account, make sure to check the promotions page frequently. 22Bet hosts many casino offers that you shouldn’t miss out on if you’re looking for some extra action. You can pick up free spins every week by making deposits, and a lucrative reload bonus is waiting for you every Friday. Free spins on popular slots and other surprises can suddenly appear in your inbox if you are subscribed to the newsletter. 22Bet has a great slots library consisting of games from top providers. You can play slots from NetEnt, Blueprint, Thunderkick, Quickspin and many more. A few games and providers are missing, but most of the must-have titles are in place. The highlight of the site is the live casino that features games from Evolution Gaming, NetEnt Live and Betgames. The live casino has high-quality versions of blackjack, roulette, baccarat and more, and you can also try your luck in the unique games in the live games section. Games such as Bet on Poker on Dice offer a different type of live experience, and you can read more about these games further up in the review. 22Bet is a fantastic new UK casino, so head over to the website and register an account to claim your 100% welcome casino bonus today!